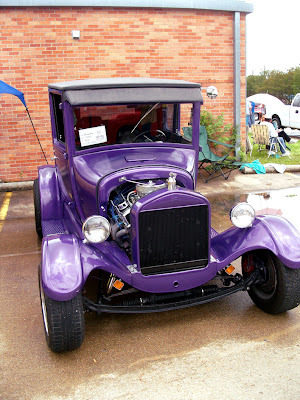 Ok.... one last photo from the car show, this one a 1929 Ford model T sedan... it feels like we've jumped directly from winter into summer here in Texas... it was already in the 90s today, but the breeze made it feel cooler. Somehow I don't think this was the original color! Looks like this was a real labor of love for someone. Henry Ford's view was that the customer could get a Model-T in any color they wanted, as long as it was black. I guess the poor guy is spinning in his grave now as he sees the U.S. Auto industry go into the tank!